The United Plant Savers (UpS) is known for having developed a list of medicinal plants at risk for over-harvest. Though the list has received some criticism because it is not science-based, UpS is recognized for its development by the herbal community, the herbal products trade, regulatory agencies and other conservation organizations. Monitoring at-risk medicinal plants continues to be an important part of UpS’s work and mission. 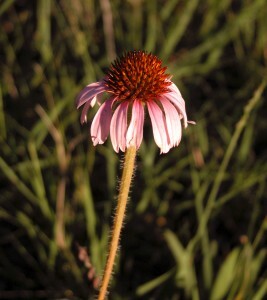 Echinacea angustifolia, one of the species at risk. *Review of the overall scoring system. *Working with people who are knowledgeable about key species and who can provide information that can be used to improve the scoring system. *Collection of field data for key species. *Development of a mathematics-based or statistical analysis for reviewing scores. *Development of more information for use on the UpS website so UpS members and others can contribute information to the ranking of plants. *Facilitation of ongoing discussion among people from many fields who have experience working with these plants, so that we will understand which medicinal plants truly are at risk.